In line for my McCafe mocha coffee (which are pretty good by the way) and the next lady asks: "What's the difference between the mocha and the iced mocha?" 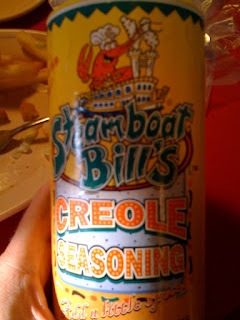 Steamboat Bill's in Lake Charles, LA. Yummy! Kids meals $3.99, adults $10-$20 and they don't skimp. Tons of fried mushrooms in the appetizer if you order that. No wonder they've been voted #1 for like 14 years. I had the Oyster Po-Boy. 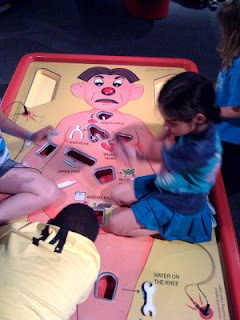 got the buzzer, the light up nose and true to form: missing parts! Q: Does the Sonic Solutions i-F2 work with the iPhone? A: Yes, at least with my 1st gen iPhone. You will get the message when that "This accessory was not made to work with iPhone" when you plug it in. It will ask you if you want to turn on airplane mode. If you don't put it in airplane mode, you will get that nasty interference when your iPhone transmits or receives data like an SMS, email, etc. The remote functions 100% as well. I found mine on clearance at Target for $32.50 which is an EXCELLENT price for this system. It's very well made, and my only regret is that there isn't a whole lotta bass, but then again it's a small system. It's more than loud enough for a room, poolside BBQ, etc. It's not a party system, unless you have a small party. :) Loud enough for guests outside, but not too loud for the neighbors IMHO. Still kinda pricy at Amazon tho!